Broadband Comes To Rural America, But How Many Will Use It? Home » Broadband Comes To Rural America, But How Many Will Use It? Green Bank, WV, isn’t exactly the kind of place you'd expect to find world-class high-speed Internet. Nestled in mountainous terrain, the tiny hamlet has a population of fewer than 200 people. As is common in many rural areas, cellphone service is unavailable for miles, but Green Bank has a rather unique communications problem: even radio transmissions are strictly limited to avoid interference with a federal astronomical observatory nearby. Green Bank is a place where many residents literally live off the communications “grid”. Once stuck in the age of dial-up internet service, residents are now getting high-speed internet. 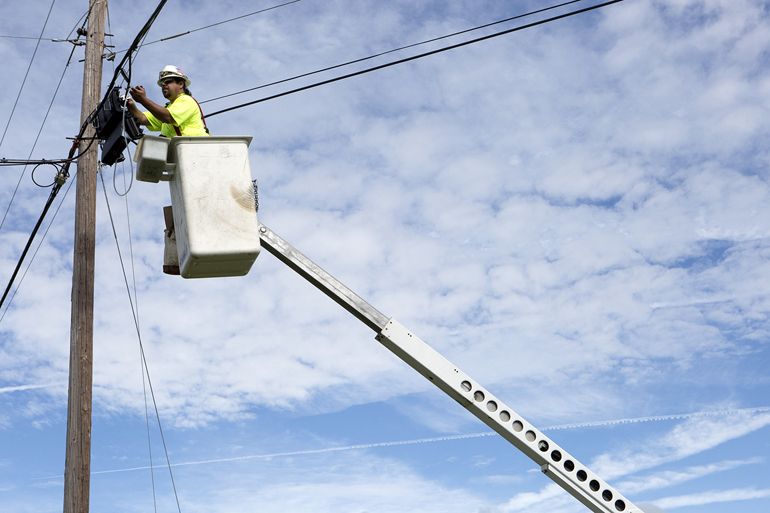 Over the past year, crews have been busy laying the groundwork for broadband service that will enable Green Bank to connect with the rest of the world. A local service provider has wired the area with fiber-optic cable, sometimes averting dangers such as black bears in order to dig lines in the ground along steep mountainsides. But how much demand will there be for broadband Internet? For rural homes without an Internet connection, the largest barrier to adoption of service is that many people just don’t feel they need it. An analysis of microdata from the Census Bureau’s 2012 Current Population Survey shows that almost 53 percent of U.S. householders without any type of Internet access cited a lack of interest or need as the main reason for nonadoption. Meanwhile, another segment of the population remains stuck at slower speeds, usually in remote areas where it may be cost prohibitive to deploy service. About 8.5 percent of Americans lack access to connections that the FCC considers to be broadband speeds. Connecting these remaining broadband holdouts, experts say, will be difficult. Data shows adoption rates outside of metro areas remain remarkably low, with less than half of certain demographic groups having home broadband access. Just 49 percent of rural householders with no college education had adopted the service, and only 46 percent of rural householders age 65 and older had done so. Lower-income families tend to connect at notably lower rates. Of households outside metro areas with incomes below $25,000, just 41 percent had broadband, while about half of those in metro areas had subscribed. Connected Nation, a nonprofit group advocating for broadband expansion, estimates that a whopping 39 percent of nonadopters would sign up for broadband service if it were offered at a lower price point. 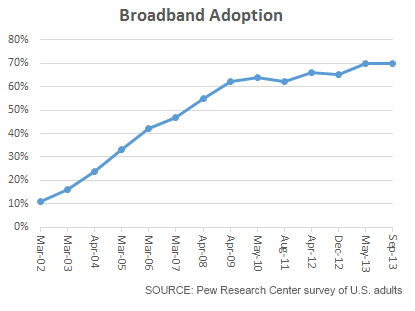 After a long period of rapid growth, the overall pace of U.S. broadband adoption has slowed somewhat. About 70 percent of Americans reported broadband connections at home in the latest Pew Research Center survey last fall, up from 64 percent from 2010. As the service extends to the rural reaches where it hasn’t existed before, it’s much harder to gain new users. While Green Bank’s fiber network is still relatively new, the campaign to install it has been ongoing for several years. Miriam Hedrick, a representative for Spruce Knob Seneca Rocks Telephone Cooperative, began generating local interest by going door to door in 2012 to sell residents on the prospect of high-speed service. The telephone co-op received a federal grant to pay for the construction of a fiber network in Green Bank as well as six other towns. The construction of the high-speed network was no easy task. The rock-filled clay soil made burying lines difficult, and since the area lies within the National Radio Quiet Zone, the workers couldn’t use wireless signals that could potentially interfere with the Green Bank Radio Telescope. Vickie Colaw, general manager of Spruce Knob Seneca Rocks Telephone Cooperative estimates that it may have cost $5,000 to $10,000 apiece to deploy Internet to some of the more isolated residences. “It’s a unique situation and not your run-of-the-mill installation by any stretch,” she says. As in many other rural areas, several of the telecom’s potential customers are older people who don’t utilize residential Internet service. 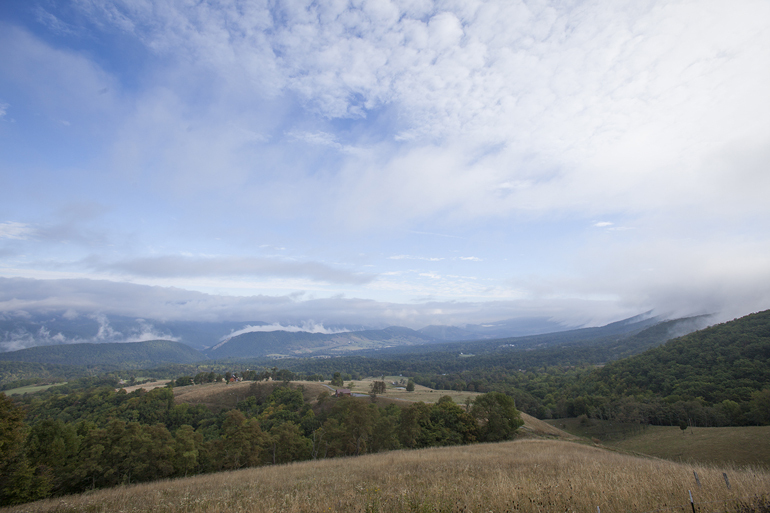 The median age in surrounding Pocahontas County is 47.5 years, about 10 years older than the national median. “A lot of the seniors we see coming in don’t even imagine all the ways they could use the Internet,” says Vicky Terry, the county library system’s director. Many parts of rural America are connected to the Internet, but usually not in ways that are useful to residents. A legacy provider in Pocahontas County offers low-grade DSL and dial-up service, but slow speeds and poor reliability limit its effectiveness. This unreliability is a source of great frustration for some locals, particularly business owners. “The Internet issue has been constant and persistent every year,” says David Fleming, the president of the Pocahontas County Commission. Fleming created an online forum for residents to report download and upload speeds on the obsolete DSL system. The owner of Murphy’s Body & Repair Shop says his attempts to participate in online auto auctions have been frustrating, as his bids don’t go through fast enough, and he is frequently forced to give up. The only nearby option for Green Bank residents without home Internet access was the local library, which was also plagued by slow DSL service. Now it appears that that will change. As has been the case in other remote areas, the economic implications of quality high-speed Internet in Green Bank are huge. Jobs remain scarce, with much of the area’s economy tied to logging or tourism. Once area teenagers leave home to go to college, few jobs exist to lure them back. Fleming says some residents might start second careers or launch Internet-based businesses if high-speed business internet service was more available throughout the county. “There’s a lot of entrepreneurial spirit here, but people need the Internet to do it,” he says. In many rural areas around the country, such as in West Virginia, it’s the small, independent telecoms that are largely driving broadband adoption. Large companies frequently balk at the high costs of broadband deployment in sparsely populated rural areas. Talking with residents directly is generally more effective in gaining new customers than offering impersonal promotions, says Rod Bowar, president of the Kennebec Telephone Company in central South Dakota. Several of the rural broadband installation efforts have benefited from federal stimulus money. Spruce Knob Seneca Rocks Telephone Cooperative in Green Bank received a grant from the federal Broadband Technology Opportunities Program to cover construction costs, although it did not receive funding for capital improvements or personnel. In all, the federal government’s National Telecommunications and Information Administration (NTIA) awarded a total of $4.4 billion in stimulus funds for broadband connectivity over a period of several years. The vast majority of the federal grant money went toward investment in infrastructure. A much smaller sum — $249 million — paid for digital literacy and other adoption projects, while another program awarded money for states to track data on broadband speeds and availability. According to NTIA, the federal assistance program was responsible for a total of 730,000 new broadband subscribers. The FCC has moved to modernize a federal program providing discounts on phone service called Lifeline to include funding for broadband adoption. The agency launched a pilot program last year to study how funds might be directed to increase adoption. Fourteen selected pilot projects offer varying service discounts to eligible low-income consumers. The enrollment numbers from the pilot are expected to help determine how the agency will structure future subsidies. Dynamic IP address refers to a temporary form of addressing used by DSL. Having a Dynamic IP address means that each time you connect to the internet, your IP address will differ from what it was previously. When your computer connects to the internet, it's assigned an IP address from a pool of available addresses. When you disconnect from the internet or power down your computer, the dynamic IP address is returned to the dynamic IP address pool. Having a dynamic IP address means that each time your modem or computer connects to the internet, it will automatically be assigned any available IP address from the pool.